With rounded to heart shaped leaves Licuala cordata is a fan palm. originally tropical areas such as Borneo to Sarawak, this is one of the most attractive of all of the low growing palms. If you are lucky enough to live in a tropical to sub tropical climate zone, you are well on you way to being able to grow this sought after palm tree. You will however first need to find the plant, it is rare in cultivation and very difficult to find for sale. One possibility is to try to find seeds for sale online and attempt to propagate it yourself. 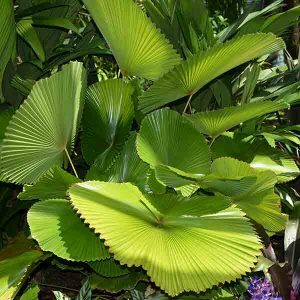 The leaves are large, pleated with serrated edges. It is a species that requires warm sheltered growing conditions. It grows naturally as an understory plant in tropical rainforests. Sought after by gardeners in tropical areas, as well as being a ‘collectable’ species it is rare in cultivation. Slow growing and rarely reaching over 1 metre (4ft) in height, this is a solitary species that only develops a very short trunk. Flowers are small and yellow followed by dark fruit which contain the seeds. Licuala cordata is a plant for the tropical and sub tropical zones, it is very difficult outside of its comfort zone. It requires a humus rich fertile soil, moist and free draining. It is a shade loving plant and would make an excellent plant for underplanting taller species in any tropical garden. In good soil, with adequate moisture you will only need to remove the dead leaves on occasion and top dress around the plant with compost and some aged manure each year. In any dry periods, extra moisture will be required. Licuala cordata is available for sale from the following nurseries.